If you're interested in casino games, Vasa Casino will help you compare online casinos. "...Puzzle enthusiasts of all ages will enjoy this challenging game." 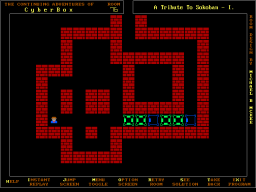 Congrats on putting a solid game together..."
"One of the most original-- but sadly unknown-- puzzlers ever made, freeware or otherwise, The Continuing Adventures of CyberBox is a great Sokoban variant that is very innovative and ingenious. Based on 1991's CyberBox, Edward Collins' version is a far superior and much more addictive than the original." puzzle game for almost 17 years! I've decided to end the madness and now offer the deluxe version for free! extra cursor images, extra box images, etc! is a thought-provoking puzzle game! Your mission is to escape from each of the 15 rooms presented in each volume in as few moves as possible. 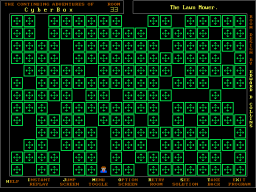 You'll accomplish this by correctly utilizing and manipulating the various types of boxes placed throughout the maze. The boxes could be Pushers, Zappers, Movers, Pullers, or Selectors and as the names suggest, they move in very specific ways. The puzzles may be solved consecutively or you may jump from room to room. The program keeps track of which rooms have been solved and the number of moves it took to solve each one. A number of handy features include Instant Replay which plays back all of your moves, a Retry option which starts you over from the beginning of the room, a Take Back option to take back a move, and a Save Your Current Position option, to easily return to a previously saved position. animation speed, cursor images, box images, and more! 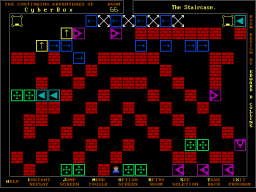 A room editor is included if you wish to create your own puzzle! to extract the files from the archive. on your hard drive, and unzip (extract) the files to this directory. Alas, CyberBox program was written almost 18+ years ago! have to download a wonderful little utility call DOSBox. with today's software and hardware! 1) Download my CyberBox puzzle game. 2) Unzip the CyberBox files from the archive to a folder of your choice. 3) Download the DOSBox emulator program, from their website. 4) Unzip the DOSBox files from the archive to a folder of your choice. 2) Then change to that drive and path and type ca-cyber to run the program. Example: Assume you've already downloaded and installed DOSBox. Run this program. You'll see the familiar DOS cursor. Further assume you've already downloaded and unzipped my CyberBox game in a folder called c:\games\cyberbox. This will emulate the DOS system on a semi-virtual "x" drive with all of the files that are in your c:\games\cyberbox folder! That's it! While in the DosBox window, simply change to the new virtual folder (cd x:) and then type ca-cyber to launch my CyberBox game! (This is the game I didn't care for. In 1996 I began corresponding via e-mail with Petr Simon, a young man from the Czech Republic. Petr also enjoyed CyberBox enough to write his own version! 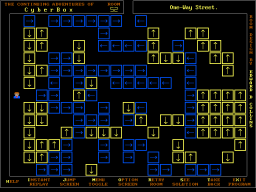 100 most popular freeware games from their site! Whoo hoo!